I got the exclusive version that comes with the additional swap out cartoon styled head sculpt. With the prototype pics I thought I'd like the regular head sculpt more since it's a more realistic style that complements this new aesthetic from Sideshow. But in hand, the exclusive head sculpt is actually nicely sculpted and painted, and the yellow does not look overly cartoonish. So I think for my display I'll be going with the exclusive head sculpt. Note that the head of the staff I have rotated all the way down the staff to the hand like it was shown in the prototype pics. Many inhand videos, including Sideshow's own unboxing video, show the ram's head just placed near the top of the staff, which makes it very top heavy and unstable. All you need to do is adjust the position of the hand once placing the bottom of the staff, and then rotate the ram's head down to the correct location just above the hand. A little pressure is all that's needed, and since the staff is metal, there's low risk of any breakage. Doing so will make sure the staff is stable and the head won't suddenly topple off. The base is nicely sculpted and painted too. Some early reports indicated there were loose pieces inside the base, but luckily mine is OK with no rattling inside. It all feels pretty solid. The lava paint app looks decent in hand, and the holes fit the foot pegs well to hold the statue in place. The sculpting and detail of the body and armour is perhaps even better than it was on He-Man. 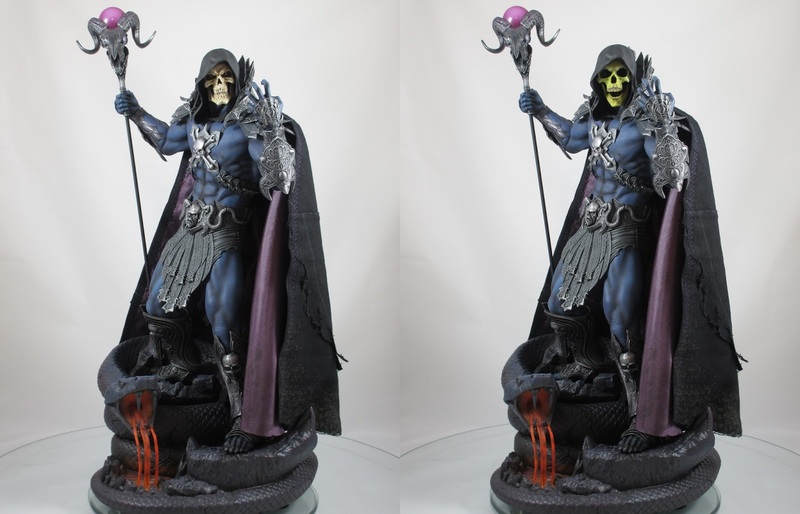 This sculpt just has so much detail, with a great bluish body paint with the black wash in all the right places to accentuate the musculature. The armour pieces are all plastic, which has annoyed some collectors, but I don't really care to be honest. The paint app looks metallic, and is flexible enough to avoid any damage particularly when placing the neck armour and cape around the shoulders. The chest armour and shoulder piece look great, again with lots of detail. The cape pegs were a bit of a pain to get in, particularly with the furry pieces wrapped around the peg. But gently prying the plastic piece wider and lining up the peg holes solved that easily enough. Before putting the cape on, make sure to give it a spray of water and a gentle iron on low heat. It will remove the extensive wrinkles since it is packaged all rolled up. The shiny inner lining will look much smoother and more natural with the wrinkles removed. There were some complaints about the hands being loose with weak magnets. The hands are looser than on He-Man for sure, but mine aren't too loose to the point I'm worried that they'll fall out. Even picking up to move they felt stable enough, but maybe just remove them when moving just in case. Again the plastic nature of the armour doesn't bother me. If noone told me, I wouldn't be able to tell the difference anyway on display! The sculpting and paint app make the armour pieces look amazing! It would've been nice if the sword was made of metal like it was on He-Man. The details are intricate, and would've been a nice touch in metal, but at least it looks nice attached via a magnet on his back. Under that cape, the excellent sculpting and detail continues to the rear of the armour. The torso, waist, and even lower leg armour really has been sculpted beautifully. It's almost a shame the cape covers it all! I did consider displaying the statue without the cape, but unlike He-Man, this Skeletor looks a little skinny without the cape. The cape gives the statue a bit more bulk and gravitas for this evil character I think. Displayed together with He-Man, these two make for I think some of Sideshow's most visually dynamic and interesting statues for a long time! The barbarian / fantasy style of these perfectly suit the adults that grew up watching the cartoon, with a sophisticated aesthetic coupled with all the nostalgic cues the MOTU line deserves. 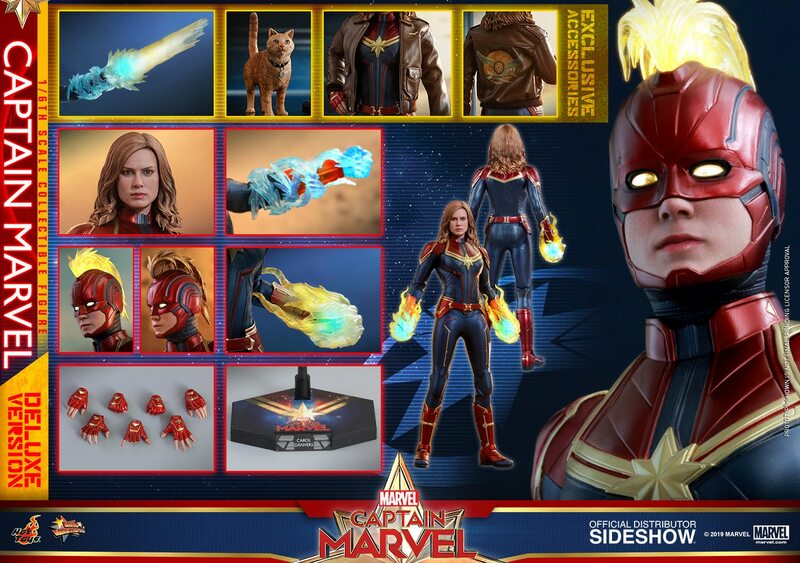 I hope Sideshow continues this line for many years to come to release all the core characters from their premium art print! Highly recommended!